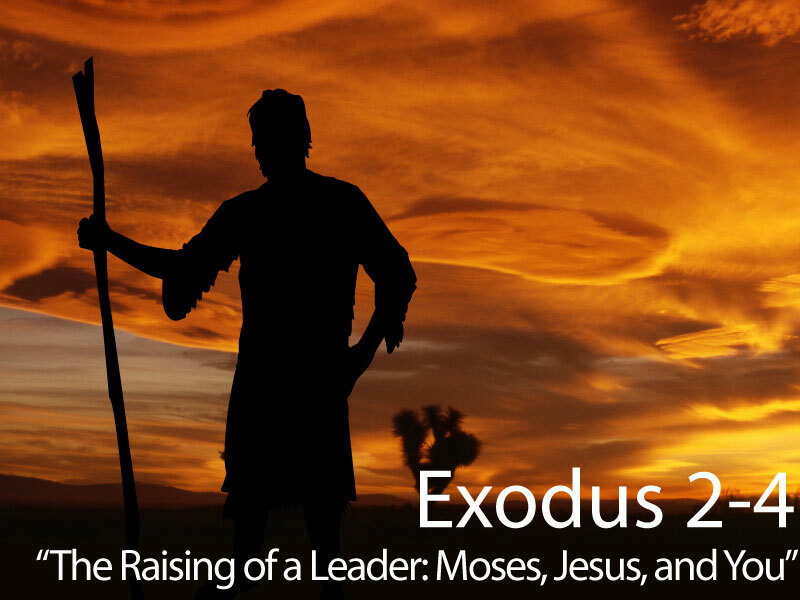 Storyline #12 – Exodus 2-4 – "The Raising of a Leader: Moses, Jesus, and You"
Read Exodus 2 – 4. This is exactly the opposite of what Moses’ mother was doing three months after his birth when she hid him in a basket and floated him along the Nile River. God had her hide Moses for protection. The daughter of the King of Egypt found Moses and ended up raising him as an Egyptian prince who was mighty in word and deed (Acts 7). God was raising Moses to lead His people. When Moses was 40, he really wanted to get to know his Hebrew relatives, so he went out among the slaves. He saw an Egyptian beating one of his fellow Israelites and became so enraged with anger that he killed the Egyptian and hid him in the sand. When word got around and the Pharaoh found out, Moses ran away for the sake of his life. Forty years later, while shepherding a flock, Moses looked over his shoulder and saw a bush in flames but it wasn’t being consumed. Then the bush started talking to him and calling his name? It could only be the desert heat getting to him or…God. After commanding Moses to take off his shoes because of His presence making the ground holy, God tells Moses His plan of using him to free the Israelites from Pharaoh and to escape Egypt. Moses comes back with five different excuses: “I’m not worthy. Who are you really? They won’t believe me. I’m not capable. Send someone else.” God responds with five direct promises: “I will be with you. ‘I am’ sending you. I will prove Myself. I will do it through you. I will send your brother, too. Maybe you are reading this article and you have come up with so many excuses not to lead others to Christ because your family-life hasn’t been the “American dream” or because you feel your sinful past has you dragging too much “baggage” behind you. Wow, you may sound a lot like one of the greatest leaders of history! God is also promising you that He will give you both the passion and the ability to accomplish every good work through you (Philippians 2:13). God is calling all of us in this passage to follow Christ and to lead others to Him. Where? He tells Moses that Israel is His firstborn Son (Exodus 4:22-23). Calling someone “son” is sensitive language. I remember hearing my dad call my brother-in-law “son” for the first time. As a man, I don’t like to admit it, but it broke my heart. I grew up being my dad’s only son. Of course I understand now. But that’s not what God was doing. He was calling Israel His firstborn Son because that was His purpose for them…to bring about Christ through birth! This passage is filled with the hope of Christ, and it is pointing us to be followers of Christ and to lead others to Him. Check out the response when Moses returns to the Israelites after over 40 years of being away: they believed him, they bowed their heads, and they worshipped God (Exodus 4:29-31). We must follow Christ toward The Promised Land just as the Israelites followed Moses to their promised land. When Jesus said to His disciples, “Come and follow Me,” they dropped what they were doing and followed Him. That is often how I picture my Christian life. I look at each decision I make and every action I take as either a step with or a step away from Christ. Thinking that really helps me visualize my walk with Jesus as a disciple. Are you reading this knowing that God has called you to both follow Christ and lead others to Him? You are called to be a leader! Reading this article right now may be many future pastors, teachers, missionaries, and ordinary people who lead others to Christ through every day conversations. Many of you who are reading are designed to be a follower. You must be careful about to Whom they are leading you. To sum it all up: Follow Christ first as you lead and follow others to Him!